If I could identify the biggest lessons I have learned in 33 years of marriage, somewhere near the top would be 1) that spousal conflict is a certainty, and 2) that some conflicts are more serious than others. To many readers, I'm sure these observations may seem self-evident (which is a kind way of saying “duh!”), but it took a long time for my wife and I to figure them out. 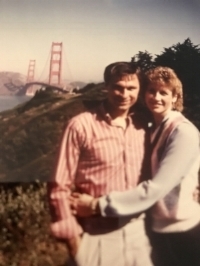 During the months of our courtship and engagement, Barb and I never had an argument. I'm not kidding. We found it fairly easy to be of the same mind, and if there was any hint of disagreement, we managed to see one another’s point of view. As a result, we were lulled into thinking that we shared nearly the same opinions on almost every subject, and that any conflicts would be rare, if they occurred at all. It didn’t take long to discover our error. Only a few weeks into our marriage, we had our first real quarrel, and it was a biggie. We were sightseeing in San Francisco, driving north toward the Golden Gate bridge. (To be accurate, I was driving; Barb was sightseeing). Our plan was to exit just before the bridge and take some photos of the landmark from the San Francisco side. Instead, I suddenly found myself driving up onto the bridge span, headed toward Sausalito and no turning back. “Didn’t you see the exit sign?” my wife asked. “No. Did you?” I challenged, deflecting the blame. “Well maybe you could stop looking around and help me out," I said, getting defensive. As the discussion became more heated and took on a life of its own, that idyllic, conflict-free relationship we had enjoyed for a few blissful months abruptly shifted to the rear-view mirror. I think what made that first argument so severe, along with some others that followed, was that we had not yet learned the two lessons I mentioned above. But it didn’t take long to understand the first one. Conflict became very certain. The second lesson took years for us to grasp. All those early squabbles were no doubt more intense and more prolonged simply because we didn't yet realize that not all conflicts are created equal. We tended to view every disagreement, even the minor ones, as threats to one another's intelligence, threats to the stability of our home, and in fact, threats to our very identities as rational humans. The result was that almost every conflict, once begun, went from zero to sixty in a matter of minutes. But all that changed when Barb (who I now know is the genius in our home) came up with what we have dubbed the “Walker Marital Discord Numbering System.” We should probably patent it, but why be selfish? We believe that marriages all over the world should benefit from it at no cost. Here’s how the numbering system works: When one of us has a complaint against the other, we call attention to the perceived fault by initially assigning it a number between one and ten. A gripe with a value of one means it is only a minor annoyance, whereas a grievance that merits a ten would be very serious, something that might actually threaten our sanity or our marriage. This gives the other spouse an idea of the true importance of the issue, and prevents us from feeling needlessly defensive or overly threatened, and minor spats now hardly ever become bigger than they should. I would reply, “Why do you have a problem with everything I do? Maybe I should just leave the dishes in the sink and let you do all the loading!" So you tell me, isn't the scenario with the numbering system better? Granted, I don’t remember us ever having a quarrel with anything more than a four or five rating, and though many of those were serious conversations, our numbering system almost always prevented the arguments from escalating to a 10 on the Richter Scale the way they did earlier in our marriage. Chances are we'll never have to go there, and I hope you don't either. So please consider this your formal invitation to try the Walker Marital Discord Numbering System for yourself and see if it works in your household. But if it doesn't, I hope your complaint against me is no bigger than a two. Maybe you and your significant other have your own way of keeping disagreements manageable. If so, please scroll down to the comments section and share your ideas! We DID make up after our first argument and took this photo.